Bristleback Build Guide DOTA 2: Scratch my back? 3. You want some of this? Never one to turn his back on a fight, Rigwarl was known for battling the biggest, meanest scrappers he could get his hands on. Christened Bristleback by the drunken crowds, he waded into backroom brawls in every road tavern between Slom and Elze, until his exploits finally caught the eye of a barkeep in need of an enforcer. For a bit of brew, Bristleback was hired to collect tabs, keep the peace, and break the occasional leg or two (or five, in the case of one unfortunate web-hund). After indulging in a night of merriment during which bodily harm was meted out in equal parts upon both delinquent patrons and his own liver, Bristleback finally met his match. Your tusks offend me, sir, he was heard to drunkenly slur to one particularly large fellow from the northern wastes whose bill had come due. What followed was a fight for the ages. A dozen fighters jumped in. No stool was left unbroken, and in the end, the impossible happened: the tab went unpaid. Over the weeks that followed, Bristleback's wounds healed, and his quills grew back; but an enforcer's honor can be a prickly thing. He paid the tab from his own coin, vowing to track down this northerner and extract redemption. And then he did something he'd never done before--he actually trained, and in so doing made a startling discovery about himself. A smile peeled back from his teeth as he flexed his quills. Turning his back to a fight might be just the thing. You can only run from Bristleback for so long before being dragged down by the green slime stuck up his endless nasal cavity. Then he mashes your face in and laughs about it. With Rigwarl, scampering around is part of the pokey mission statement. You're going to be running enemy heroes down and gunking them up with your own mucus. You're going to be making last-second escapes, juking with low health and running your armored tail back home to the Fountain. Rigwarl is one of the most edge-of-your-seat, exciting heroes to play in all of Dota 2. And he's extremely frustrating to play against. His spammable spells Viscous Nasal Goo and Quill Spray are infuriating in the laning stage and can shut down almost any combination of enemy heroes early game. This is all while Warpath turns Bristleback from an annoying laning opponent into a terrifying and mobile duel enemy. The incredibly unique passive Bristleback is fun to use and master. More importantly, it makes you a beast in the rundown game and impossible to kill in many circumstances. Timing and reaction speed is key when playing Rigwarl, which only adds to the excitement and fun factor. You best watch your back. He cuts quite a figure. Distilled Steam Guide version coming soon. "Oh, where are my manners." Viscous Nasal Goo is one of the skills that makes Rigwarl such a frightening chaser. In the lane, this skill is devastating, especially against melee heroes. Be relentless with it and make sure you deny your enemy any farm in the early stages--one of Bristleback's greatest strengths. Aside from slowing down the target, Viscous Nasal Goo reduces armor. This is of key importance, especially in conjunction with Quill Spray and your auto-attack. In a pinch, you can blow green snot on an enemy chasing you down to make an escape. But keep the cast time in mind, or it could end up being your final sneeze. Note: Casting Viscous Nasal Goo on an enemy will dispel the effects of a Healing Salve. "Quilled in the line of duty." Quill Spray is a nifty area of effect nuke Rigwarl has at his disposal. With relatively low mana cost and cooldown time, this is a very spammable (and thus annoying) spell that you can use all game. Quill Spray gives Bristleback a constant presence in teamfights and can finish weakened foes like it's nothing. Since the damage is applied instantly, you can use Quill Spray to secure otherwise difficult last-hits in the lane. In general terms, this skill is great for farming up the neutral camps. When chasing down or running from an enemy, this is a skill you want to be using on cooldown. Although the initial damage is negligible, a few stacks of quills can add up fast. (With a cap at 400 damage--which is nothing to scoff at!) This isn't even considering the benefits you gain from Warpath. And the mana cost is so low that there isn't much reason not to! "Oh, me back needs a scratch." Bristleback is Rigwarl's signature move that reduces any and all damage (both physical and magical) from the rear and sides. This is a skill that takes time to fully understand and master. This is one of the most frustrating passives to play against, especially in the prickly hands of somebody who knows what they are doing. Taking the time to fully understand how Bristleback works will pay off in dividends in your games as the snot hog. Bristleback's rear is considered to be 70 degrees (on either side) from directly behind him. Add another 40 degrees (totaling to 110) and you've got his side angle. 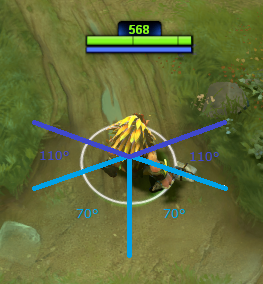 The below image should help make the angles that Bristleback takes effect more clear. As you can see, Bristleback takes effect in a wide area surrounding Rigwarl's backside. Keep these angles in mind when you are turning to eat the brunt of an incoming nuke or are running from an advancing enemy hero. Every 250 damage Rigwarl takes from the rear releases a volley of Quill Spray. Combined with active use of the Quill Spray skill on cooldown, you can stack up quills on your target in a hurry. These are the basics of Bristleback's back-and-forth style of chasing. An enemy hero will begin running you down, hitting you in the back and taking a mouthful of Quill Spray for lunch. Once you've stacked enough quills on your chaser, you can whip around, slow him down with Viscous Nasal Goo, and viola--the tables have turned. Because of this, baiting becomes a huge part of Rigwarl's game. This sometimes means living life on the edge (i.e. low health), and knowing how much punishment your behind can take. This way you can essentially fool overconfident foes into chasing you down, only to find themselves trapped deep in your territory with a 5 stack of quills stuck to their face, drenched in your runny mucus. Note: Bristleback does not reduce incoming damage from towers. Note: Bristleback also mitigates damage over time (DoT) spells (such as Doom and Orb of Venom) when Rigwarl has his back turned to the enemy hero. "What'd you take me for, eh?" Warpath is Bristleback's ultimate ability that gives him bonus movement speed and damage each time he casts a spell. This is a passive that comes off as strange and ill-fitting at first glance. In reality, Warpath is part of what makes Rigwarl a 1 on 1 beast and allows him to run down and decimate enemy heroes quickly. Because of the spammability of Rigwarl's spells, Warpath stacks up quickly and makes Bristleback a force to be reckoned with. Note: Using items does not trigger Warpath. The three Iron Branches provide a cost-effective stats boost and one Healing Salve and set of Tangos are more than enough regeneration to have in the lane. Those three Iron Branches also build into Magic Wand, which you'll rely on heavily. Note: Stout Shield can be picked up in place of Quelling Blade to take a more defensive stance in the lane. "Skint me clean for this?" Magic Wand is too good of an item to pass up on, especially considering how fast you can build it out of the starting gate from those three Iron Branches. For a measly 275 gold, Orb of Venom is a big-time item for Bristleback, especially in the early to mid game. The movement slow effect combined with Viscous Nasal Goo is vicious when chasing down enemy heroes. The damage over time effect just sweetens the pot. Medallion of Courage is a great pickup for Rigwarl, providing both armor and mana regeneration buffs. The active ability is just as sweet, making Bristleback an even more scary 1 on 1 opponent. Hood of Defiance provides magic resistance and health regeneration and is extremely valuable to have in the mid game. The Ring of Health that it builds from can be picked up before your Medallion of Courage, depending on the flow of the game and your need for health regeneration. Vitality Booster is a supreme pickup, especially when compared to Vanguard and Blade Mail (which I explain in greater detail below). It also builds into your eventual Heart of Tarrasque. If your farm isn't bad, Sange is another sweet and relatively cheap item that provides both +16 Strength and +10 damage. The passive effect is the real kicker though, a lesser maim that can really come in handy in the chase game. Note: While I believe Power Treads to be the best boot pickup for Rigwarl, Phase Boots and Tranquil Boots also have places in his item build. A pair of Tranquil Boots can really help out if you find yourself stuck in a lane against two heavy harass heroes. They can also give you some more leeway to be aggressive in the lane with both Quill Spray and Viscous Nasal Goo. Phase Boots can give you a ridiculous amount of added chase power, especially when combined with items like Orb of Venom and Radiance. Note: "No Vanguard? No Blade Mail? What gives?" You should avoid these items as Bristleback and here is why: Rigwarl's passive Bristleback already grants an insane amount of damage reduction. You'll already be building tank items, and guess what? That Vitality Booster I recommend buying? It gives you the same +250 health buff minus the relatively pointless health regeneration buff you get from Vanguard. And this is all for 1125 less gold. Merlini does a nice job explaining it in this video. With Blade Mail, you will only be reflecting damage when enemy heroes are attacking you. Bristleback works counter-intuitively to Blade Mail since you're already reducing incoming damage. This isn't even to mention that competent players won't touch you when Blade Mail is active. "Cost more than a bit of honey." Straight survivability items are your end-goal as Rigwarl. Both Heart of Tarrasque and Assault Cuirass are great items. I usually pick up Heart of Tarrasque first, considering it builds from the Vitality Booster we picked up earlier. And if you can afford it, Radiance makes you an even greater (and annoying) presence in team fights and improves your rundown power by a huge margin. "This better be worth the grubbin." Ring of Basilius is a great pickup that can help out Rigwarl's dismal mana pool in the early game. I suggest grabbing this item if you find yourself spamming Quill Spray more than usual and are starved for mana. As far as utility items go, Bristleback can roll with any of the three-- Mekansm, Drum of Endurance, and Pipe of Insight. These are the definition of situational pickups for Rigwarl and you should only decide to buy these items if nobody else on your team has one, and there is a need. Otherwise, continue working towards your other items. Heaven's Halberd is a nice item to have if you have a hard carry right-clicker on your squad like Drow Ranger or Ursa. The same goes for Rod of Atos. Urn of Shadows can be picked up in place of your Medallion of Courage, and this comes down to personal preference. I decided to include Medallion of Courage in the main build over Urn of Shadows because it is easier to build and costs less. "Okay, here's the plan. Look, I'll hit em, and you just stand there looking... small and¦and weak." Sniper's passive mini-stun Headshot can stop up enemies for your to run down, and Rigwarl's Viscous Nasal Goo allows him to auto-attack enemy heroes down in a flash. Shrapnel slows down enemy heroes as well. Combined with his ultimate Assassinate, nobody is escaping the Sniper/ Bristleback tandem. "I'll hit em. You stand there looking small and weak." Another right-click hard carry, her Frost Arrows slow down enemies for you and benefit from the reduced armor debuff of Viscous Nasal Goo. Her Precision Aura also buffs your physical attacks like Quill Spray. "Let's put our differences behind us. What do you say?" Dazzle can keep you healed up in the lane forever and his Shallow Grave spell can be clutch in running situations. His slow spell Poison Touch works wonders for nabbing early kills and his ultimate buffs your armor and lowers enemy armor. What's not to love? "Look, we can all fight each other once the killing is done." Similarly to Dazzle, Omniknight can help you maintain a presence in the lane and his Degen Aura works in conjunction with Rigwarl beautifully. "Is that a bat you was riding? Who rides a bat?" Batrider's Sticky Napalm is a huge pain to deal with as Rigwarl, as turn speed is of utmost importance. Firefly makes him tough to chase and Flamebreak can knock you out of position easily. "The Oglodi, they don't die easy, I will give 'em that." Axe's taunt Berserker's Call forces you to face forward and attack him, which is never a good thing for Rigwarl. While taunted, you aren't able to cast any spells and that means no Quill Spray stacks or Warpath build-up. Bloodseeker's silence Bloodrage is extremely annoying to play against, and Rupture stops you from being able to chase and run. Thirst makes it easy for him to chase you down or run away when you're injured. Make sure to always carry a Town Portal Scroll! "One less bug in the world." Impale will stop you in your tracks and is a huge detriment to your ability to chase and run. His ultimate Vendetta makes it easy for him to escape being run down. Mana Burn is the real enemy here, being especially effective on the unusually high Intelligence Rigwarl. Quill Spray is no longer blocked by Vanguard, Stout Shield, etc. I plan on adding high-level replays of Bristleback gameplay soon, as well as more item builds (and more information in the item build section in general, since there are a number of options when playing Rigwarl). I want to add more detailed chase information, and a distilled Steam guide version is coming soon too! The extremely helpful Dota 2 Wiki, which I use countlessly in the process of writing guides like this one. Get yourself real familiar with these juke spots--especially when you've got a Quelling Blade. Written by SaphironOfBlood. Love the content these guys create, check them out. Enjoy my work? I've also written guides for: Treant Protector, Timbersaw, and Puck. You can check out my personal Dota 2 blog here.